Do you have a vision for what you want to achieve in your communication career? An IABC membership can help you get there and drive your impact in bigger and more visible ways. Refer four or more new/reinstating members and get a year of free membership. The current member who refers the most members during October will receive a free one-year subscription to Leaderbox ($790 value https://leaderbox.com/?direct?). Only one winner will be selected. If there is a tie, we will randomly draw the winner from the tied top recruiters. The current member who refers the most members during October will be featured in the IABC Digest email to tell their story and how they’ve expanded their impact through their membership. Be recognized on the IABC website as an IABC Champion for the months of November and December. Special recognition at the IABC 2019 World Conference as an IABC Champion. What you need, and who you need to know, for the results you want to deliver. 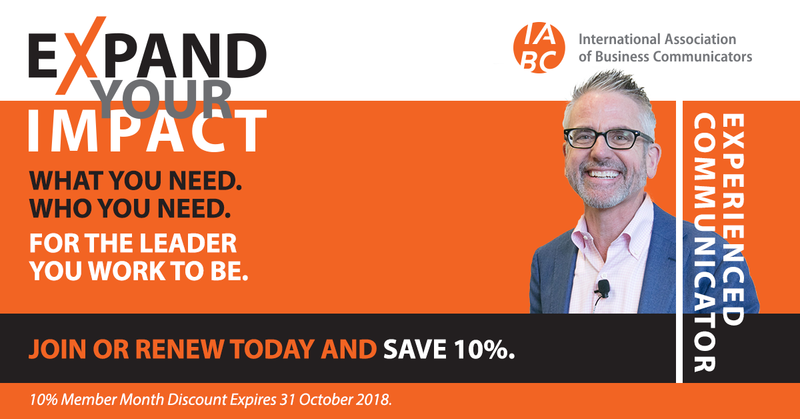 Join IABC/Renew Your Membership Today!